The town of New Quay overlooks a natural harbour which is well protected except from the north wind. 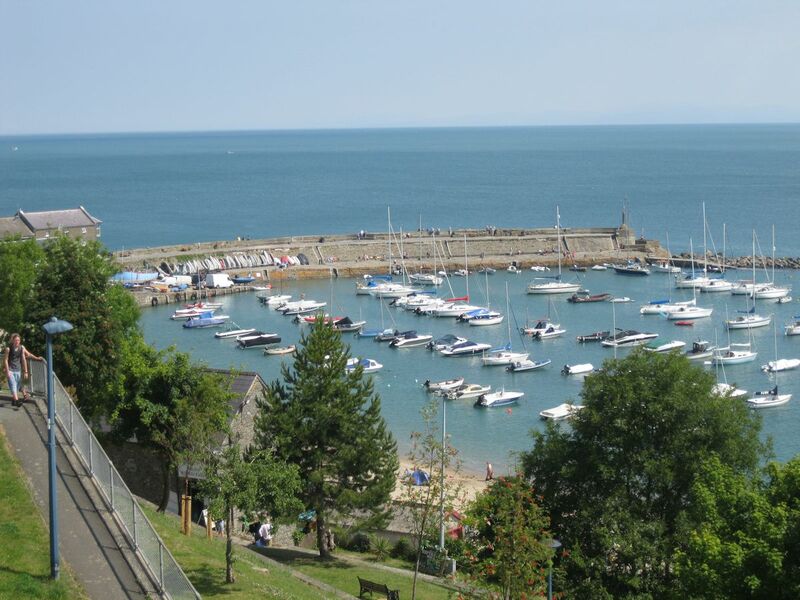 At the end of the 17th century a ‘new quay’ of wood and stone was built to protect the harbour from the westerly winds. The town grew slowly, probably as much to serve the ship builders' yards as anything else, but a large number of sailors made New Quay their home. The town prospered particularly between about 1820 and 1860. The stone quay was built between 1835 and 1837. In 1864 the railway reached Aberystwyth from the north and three years later the Carmarthen to Aberystwyth line was completed. Many of the supplies for the surrounding countryside which had come through New Quay began to arrive by rail including artificial fertilisers which replaced the lime burnt in many of the lime kilns on the beaches. At the same time, steam ships replaced sail, and these were generally too larger to call at New Quay. The stocks of herring which had been an important source of food and income for the town, declined and the harbour began to silt up. There were plans to make New Quay a major port for journeys to Ireland, which did not come to fruition. It was never connected to the railway network, but became a popular holiday resort from the 1870s. The stone quay and the lighthouse, known locally as the Pepperpot were partly destroyed in the ‘Royal Charter’ storm of 1859 and the lighthouse completely destroyed by a storm in 1937. Dylan Thomas once lived here and New Quay is probably the 'cliff-perched town at the far end of Wales' on which he based Llareggub in Under Milkwood. The miles of secluded coves around New Quay provided ideal hiding places in the eighteenth century for smuggled goods such as brandy, tobacco, wines and spirits. Harbour fees are listed here.